Mec's website has the wenoka stainless steel blade above for $21, Titanium for $42. MEC has a knock off of that knife for $28.. Doesn't float, it's a dive knife. Bought it at Groundhog divers in Kitchener for $60. What does it cost? It looks like it wouldn't float, does it? same here my son and I have the titanium version. The deal of the Fishing and Boating Show was the purchase of a medium sized ziplock bag for $5. Hmmm... then you could fill it up with bulk plastic baits of all differents types. I must have got 30 or more. Just what I need to go along with the 50 or so packages I already have. Couldn't resist though, for $5. I haven't used the sheath enough to have a good opinion of it. It's kydex, so it's easy enough to modify. The knife if 1of 5 prototypes that were sent to various whitewater paddlers/writers to test. It never made it to market. 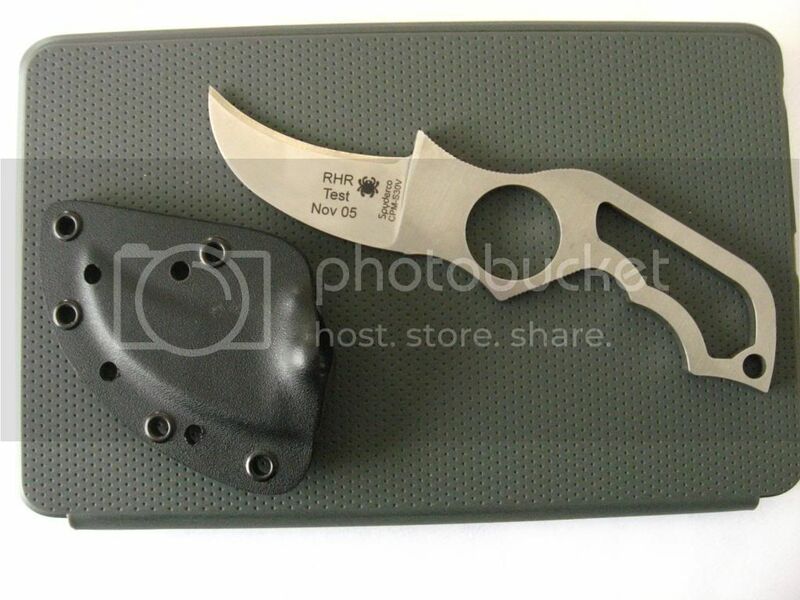 Only rescue knife that I know of that has the edge on the "upper" side of the blade. Obviously The Dawg knows someone in D&D at Spyderco. When I was teaching at the IED School, we used to get new stuff from all sorts of vendors to try in the field . Spyderco sent us some ceramic blade knives to try...fail. I like that knife but the sheath is pretty bulky. great knife ... you r right .... never seen it how well does it stay in the sheath ? Also Looking forward to the Jim Saric 2 hr Musky Master session 8-10am on Saturday. Costs $15 but also covers your entry to the show. Could be interesting. Women Love me, Fish Fear me. Went this past Saturday, got myself a new E21 Wild Black Carrot stix, 7' Medium Fast with micros. First time buying micros heard lots about them decided to give em a try. As for the knife, I found one in a pile of 2 for 20 's its MTech folding, with the pinto point as well a serrated edge. with a light sharpening to get it to my liking I found a great knife for essentially 11 bucks. I really like the benchmades and spyderco. Had a spyderco a while back and lost it, but really loved that knife. I'm seriously contemplating a sidescan hummingbird unit too. It's overkill, but I love the idea of seeing that level of bottom coverage on my home waters. Looking forward to seeing all the small sunken boats and snow machines that I know are on the bottom in the area I go to. It will be good for fishing, obviously, but it will also just be cool to check it all out. Gonna make a serious attempt at going deeper and trying to find some lake trout up there this year too, and probably throwing a downrigger into the mix as well.